SOUNDGARDEN, DEF LEPPARD, and THE OFFSPRING lead the music lineup for America’s Biggest Memorial Day Weekend Party, which features the best current rock artists and classic bands. The three-day camping festival features music on three stages, as well as a campground stage to keep the music going all night long. With onsite camping amenities and unparalleled VIP packages, Rocklahoma lives up to its motto of “Life, Liberty & the Pursuit of Rock.” In 2016, Rocklahoma had its biggest year ever, with over 70,000 fans attending the festival’s 10th year. Registration for the Miss Rocklahoma competition is underway now through March 31 at www.Rocklahoma.com. Voting on the Top 10 finalists begins April 10 and five finalists will compete on stage at Rocklahoma for the chance to be named Miss Rocklahoma 2017. A limited number of River Spirit Casino Groupie packages are still available. VIP Reserved, River Spirit Casino Roadie and Rockstar Packages are SOLD OUT. For full details, please visit www.Rocklahoma.com. As in the past, General Admission ticket discounts are available for active military through Rocklahoma partner GovX (www.govx.com). The campgrounds are a unique part of the Rocklahoma experience, with an endless party running around the clock for four days. General Admission Camping and VIP Camping tickets may be purchased as an add-on during online checkout at www.Rocklahoma.com. Campgrounds open on Sunday, May 21 at Noon and will remain open until Noon on Tuesday, May 30. Camping is only available with weekend ticket purchases and prices for camping will increase on Monday, March 27 at Noon. In addition to music, Rocklahoma offers multiple onsite experiences, including those listed below. Monster Energy: Keep the energy up all weekend long! Stop by the Monster viewing deck to refuel and meet some of your favorite Rocklahoma artists! Check the Monster socials the week of the show to get the meet and greet schedule. Zippo: Zippo Encore will be back in action at Rocklahoma with a full stock of Zippo lighters, including the limited edition festival designs! Come by and spin their wheel for great prizes, enter their Zippo Custom art contest, and get your Zippo lighter filled for free. River Spirit Casino: River Spirit Casino can’t wait to rock out with fans at Rocklahoma 2017! Stop by our Rocklahoma Chill Zone to kick back with a cold drink. The brand-new River Spirit Casino and Hotel is Rocklahoma’s official Play & Stay destination! 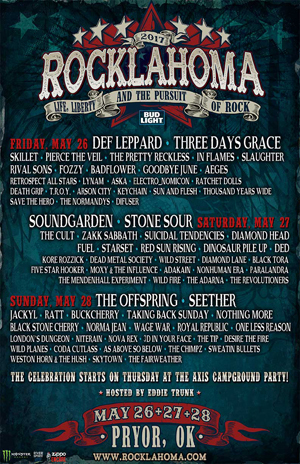 Rocklahoma is produced by AEG Presents, and is part of the World's Loudest Month concert series, which features the biggest names in rock music performing in eight distinct U.S. concert atmospheres during six consecutive weekends in April, May and June of 2017.